Jamie Gibbons, owner of Atlantic Retinning and Metal Refinishing (previously) in Manhattan, says, "Dents give pots character. I don't touch them unless people ask me to." Artisans at this shop restore each piece to an almost "like new" condition by using those time proven tinning techniques one finds in the best European cookware centers. The most prominent fixtures are a vat of molten tin and a gas forge. Gibbons rejuvenates copper pots and pans by applying hot tin to the interiors, then quickly wiping them with cotton. 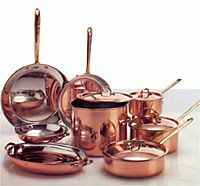 All copper cookware, except sugar melters, must be lined, to keep the copper from reacting with acidic foods and becoming discolored or toxic. Because it is lightweight and inexpensive, tin is the most commonly used lining. To find a replater or tinner, ask local antiques dealers for recommendations. Don't be surprised if their favorites are out of state; Gibbons gets referrals from cookware stores around the country. When you unwrap your newly lined pan, you won't see the traces of the ordeal it went through to regain its sheen. For Gibbons, through, each step of the process is as essential as the final polish. "As grungy as it is, I get a real special feeling out of doing something right."